Usually I make a ceviche with the Tilapia I get from the San Pedro Fish Warehouse but this time I had no time and nothing set for dinner. 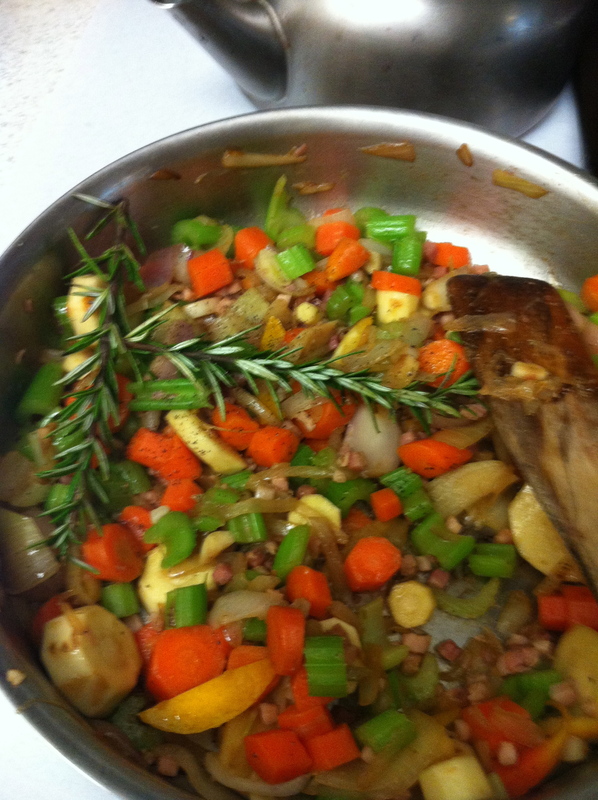 I used a recipe that my Italian neighbor in Monza, Italy taught me for veal. It worked well for the Tilapia! I set out a plate of olive oil, a plate of polenta mixed with salt, pepper and a tiny bit of chopped fresh sage. I dredged the fish in olive oil then coated it with polenta. Once fish is ready, prepare spinach to be steamed. I had another little saute pan ready for my shrimp. I only had about 6 shrimp but it made for a good side. At the same time with the fish, I cooked the shrimp, but in separate saute pans. For the shrimp chop up some garlic-about one clove and chop up a bunch of parsley, even the stems. Add the garlic to the pan with olive oil. Add the shrimp. At the same time, add the fish to the other saute pan with hot olive oil. Place the fish on one side and let cook for about 2 minutes before turning to the other side. Start the spinach for steaming. Soon in about 15 minutes your entire meal will be ready. 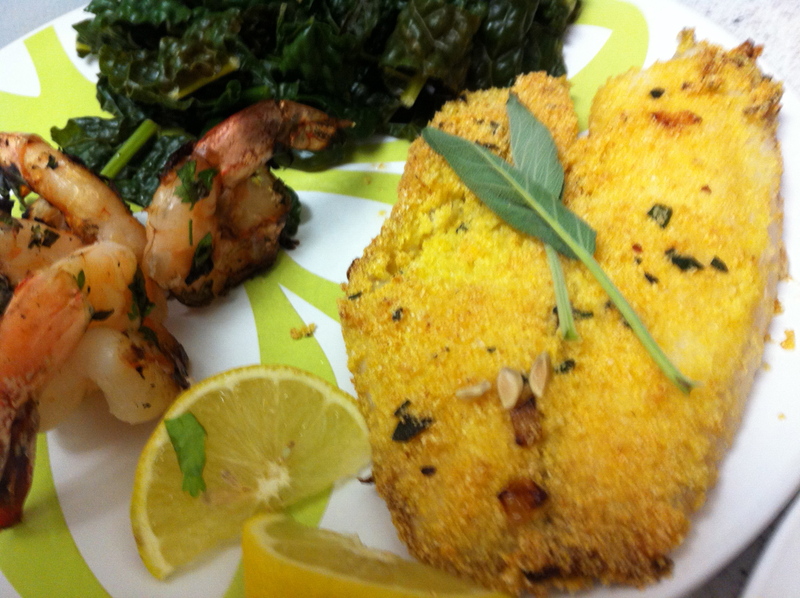 Make sure you have cut up lemon for the fish and shrimp. Squeeze out the excess water from the spinach. This was really yummy! Inspired by a trip to the Redondo Beach farmers market I picked out a bag of mixed vegetables. I got 6 round zucchini for $1. I decided they were perfect little vehicles to stuff. I wanted the meal to be fairly healthy and not carb packed. I cut the tops of the rounds and then scooped out the meat with a spoon. 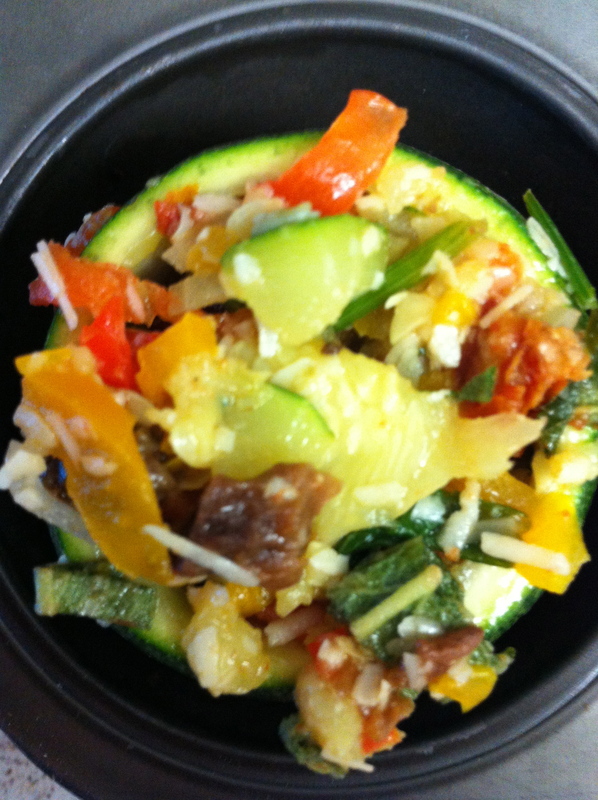 I chopped up the zucchini innards and sautéed them with some garlic, olive oil, peppers and salt and pepper to taste. 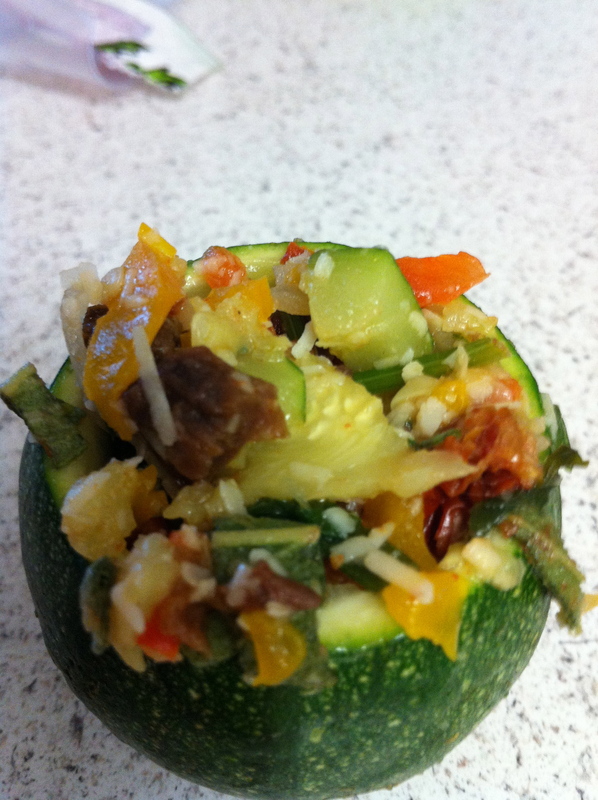 I then stuffed the mixture back into the zucchini rounds and baked it at 350 degrees for 40 minutes. At the last 10 minutes I added some grated parmesan cheese for flavor. While it was cooking I made my mango salsa and then fired up the grill to cook the tuna. 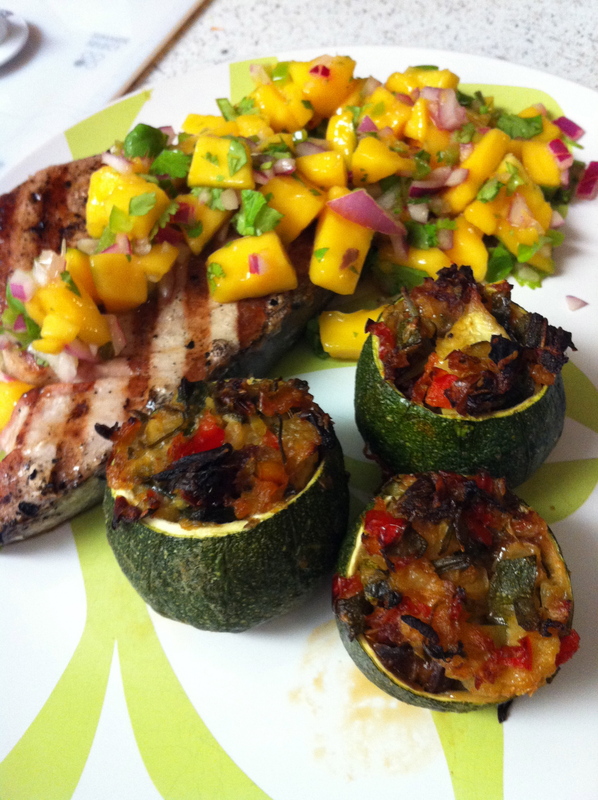 All in all it tasted good but I would pair up the zucchini with some other protein like chicken, steak or pork chops… or another fish minus the mango salsa. The flavors were fighting each other. 2 flour tortilla per person or saltines crackers. I prefer the crackers but my husband likes the tortillas. To start, chop the onion up and put in a big pot to saute with some olive oil. Once the onion has cooked for about 3 minutes add in the beef and pork. 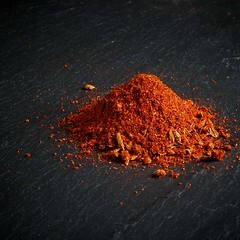 Add in the salt and pepper, red pepper flakes and some chili powder, maybe a big heaping tablespoon. Make sure the meat mixture is well browned, but not too browned. Add in the cans of tomatoes. Cook covered for 15 minutes. Add the beans and let simmer for about 45 minutes covered. Uncover for the last 15 minutes. Add the chocolate and stir in. Meanwhile grate some cheddar cheese. I prefer sharp cheddar. Chop up some chives and heat up the tortillas or get out the saltines. Serve a 2 big ladles per bowl. 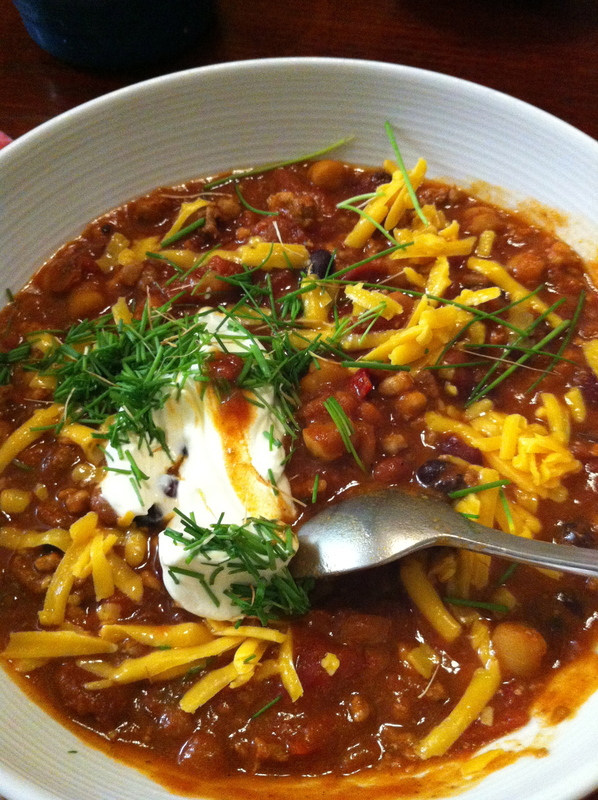 Add a dollip of sour cream, add the cheddar cheese and top off with some chives. Again, YUM!!! I received my farm fresh to you box at my door. It was filled with yummy vegetables including organic celery, Nantes carrots, fennel and some radishes of all sorts of different colors. I decided to do a quick saute and it ended up delicious. I used a bit of olive oil and chopped up garlic and shallots to start. I then added my finely chopped carrots, celery, fennel and then some radishes. In the end I seasoned with some of my Sel De Cali, the chardonnay infused salt and a few sprigs of rosemary. I can’t remember what the main protein was for this meal, but I’m sure it was either steak, chicken or pork chops! 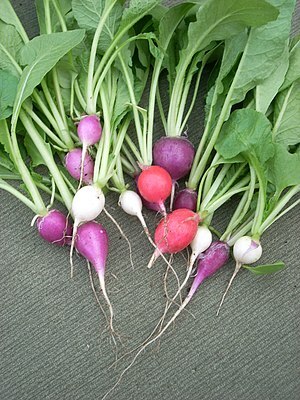 It was the first time I added radishes to a saute and it turned out delicious!